A good old Australian meat pie and an afternoon at the footy screaming your team to victory goes hand in glove; it's very Aussie! It's a cold winter's day and the wind is whipping up around the MCG (Melbourne Cricket Ground), your team are two goals ahead with the opposition coming on hard, they have the football right in front of their goal posts with three minutes to go in the third quarter. They could just score a goal which would put them in a winning position in the last quarter. After all they will have the wind at their back then. There is the shouting and the screaming from everyone urging their team on, it just doesn't get any better than this! This is the atmosphere at all big AFL (Australian Football League) games, and of course, the other thing you can be sure of there will be tens of thousands of our Australian Meat Pie consumed at footy matches all over Australia, it's a must along with the passion for your team. But what makes our meat pie such an icon amongst us as a nation and at our national game? Well the meat pie can be classed up there with our national dishes such as ANZAC biscuits, Lamingtons, Damper and Pavlova. With the arrival of white settlement to Australia the British and Irish brought with them a lot of their traditions to the new colony and one of those was the meat pie. Both the English and Irish settlers, the convicts as well as their guards, had their own versions of the pie. The English pie dates back to medieval times and included such styles as steak and kidney pie and Cornish pastry. The Irish can lay claim to the Guinness pies. The interesting fact is that the pie can be traced back to the ancient Egyptians' who made a sweet pie from rye, wheat and barley filled with honey. Maybe a long distant relative to the apple and apricot pie perhaps? Our meat pie was originally made from mutton because it was far cheaper to produce than vegetable ones were at the time. Our famous Aussie pies have stood the test of time with brands such as Sargent, Four and Twenty and Mrs Mac's being able to trace their history back many generations. What makes our Australian meat pie different from others is ours is the size of snack foods and eaten as a take away such as the hotdogs and burgers are in America. 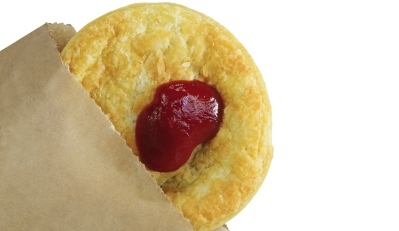 It has been estimated that here in Australia we eat about 12 meat pies per year per head of population so that is a bloody lot of pies and tomato sauce. We now have many and varied styles of the pie and with a lot of mass immigration from Europe after the second world war the gourmet pie was introduced by such companies as Villi's. The family escaped Hungary in 1956 and arrived in Australia. Their pies are exported to many other countries in the world today. The original meat pie, as mentioned, was simple mutton with gravy, but we have become quite sophisticated with our pies in both the making and the eating of them. We even produce cocktail size pies that are handed around on platters at special events, quite toffy really. Now we go onto another delight in our culture, which a lot of people might think is a bit weird! The pie floater is a pie floating in thick green pea soup with a big blob of tomato sauce, if you like tomato sauce with it, served in a dish and you eat it with a spoon. This is a real treat and a must try for anyone who never has indulged in the traditional pie floater before. Adelaide is extremely well known for its Pie Carts and the pie floater. The pie floater was recognised as a South Australian Heritage Icon by the National Trust of Australia in 2003. 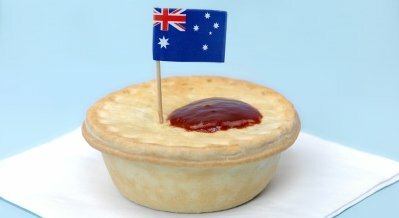 The other cities in Australia that have the pie floater is Sydney & Newcastle. 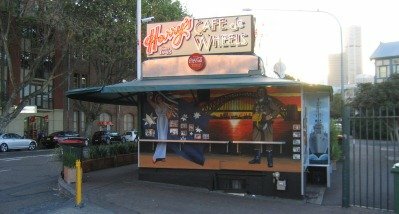 Harry's Cafe de Wheels Pie Cart in Sydney is listed on the National Trust Register as an historic icon. Pie carts are really our version of hot dog stands in streets in America where you order your hot dog the way you like it with sauce, mustard or whatever takes your fancy. The pie floater originally came about in Sydney during the Great Depression as a nutritional way to help feed the homeless and people who had left their land and headed for the city in search of work. Pie manufactures donated the left over pies to the soup kitchens and they would add it to soup, which was normally pea and ham as it was easy and cheap to make. It had good nutritional value as well. 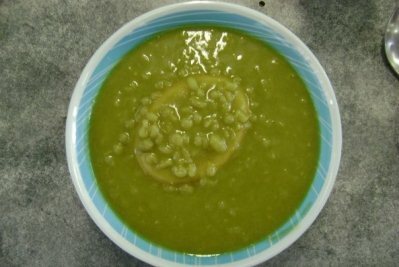 Personally, I don't find the pie floater in any way appealing to my appetite but according to a lot of my friends and family the pie floaters are a very satisfying thing to eat when you've had a night out and are feeling under the weather. Or as we say in Australia plastered, legless or just plain had too much to drink. So if you are a visitor to one of the places that has a pie cart you might just want to give it a go or if you think that the pie floater is not your type of taste sensation at least try the good old Aussie meat pie, slap a bit of sauce on it and get eating...... Nothing better!